An article in the New York Times explored a new approach to getting patients take their medicine properly: paying them. Using monetary incentives raise a lot of thorny issues. But whether or not incentives are the answer, it’s clear that medication compliance is a major issue for seniors. According to the New England Healthcare Institute, a research organization, about one-tenth of hospital admissions and one-quarter of nursing home admissions are the result of incorrect adherence to medication. Those are staggering numbers. We also know from our experience at ComForcare that medication mistakes often result in falls (due to dizziness or lightheadedness), a significant concern for older adults. • Cognitive impairments (They don’t understand they’re supposed to take medications or memory loss causes them to forget to do so. Medication compliance aids and tips can be found online. 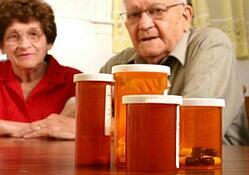 And the American Heart Association offers lots of tips on remembering to take one’s medicine properly. In-home caregivers (like those at ComForcare) are trained to work with client-specific medication profiles to ensure all medication is taken on time and in accordance with physician orders.